Renal cell carcinoma with syncytial giant cells (SGCs) is rare; to our knowledge, there are only 3 cases reported in the English literature. We report on a case that, unlike previous reports, was associated with higher grade renal cell carcinoma and an aggressive behavior. A 63-year-old man with gross hematuria was found to have a large left renal mass and no evidence of metastasis. The nephrectomy specimen contained a 14.8-cm mass that was confined within the renal capsule. Microscopically, a 1.8-cm area of SGCs was noted in a background of clear cell renal cell carcinoma of Fuhrman nuclear grades 2 to 4. The SGCs had voluminous cytoplasm, multiple large nuclei with prominent nucleoli, and focal emperipolesis. Identical to the background mononuclear tumor cells, the SGCs were positive for AE1/AE3, vimentin, and epithelial membrane antigen and negative for CD68, Î²-human chorionic gonadotropin, and mucin. Three months after surgery, the patient developed metastases in the liver, right kidney, and lungs. Giant cells, commonly multinucleated, of distinct morphology and histogenesis have been described in both reactive and neoplastic processes. In the kidney, 4 types of giant cells have been described in association with renal cell carcinoma (RCC). Benign osteoclast-like giant cells are seen in both conventional and sarcomatoid areas of RCC and are thought to represent a host reaction to the neoplasm.1 Renal cell carcinoma with a sarcomatoid component may contain pleomorphic or bizarre giant cells.2 Rhabdoid cells are well documented in RCC and are malignant tumor cells associated with RCC of higher nuclear grades and poor prognosis.3-5 Most recently, 2 case reports documented 3 cases of RCC with syncytial giant cells (SGCs).6,7 These giant cells were of epithelial origin and were neoplastic. They had ample clear and eosinophilic cytoplasm and multiple nuclei similar or identical to those of adjacent mononuclear tumor cells. Two cases were associated with low-grade RCC, and the patients were free of disease at 3 months and 4 years after nephrectomy, respectively. The third patient was well and alive 6 years after surgery, but the grade of tumor was not reported. We describe a case of RCC with SGCs that was associated with a higher grade RCC and an aggressive clinical course. Results of an extensive immunohistochemical study and a review of literature are provided. A 63-year-old man presented with gross hematuria and urinary retention 1 week prior to admission. 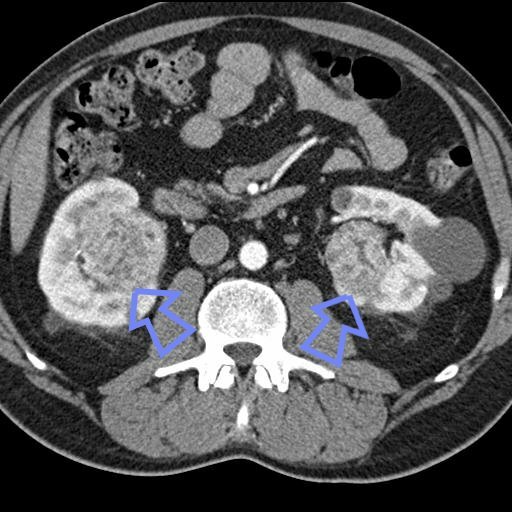 Abdominal magnetic resonance imaging and computed tomography identified a large mass in the left kidney and numerous obstructing blood clots in the left renal pelvis, left ureter, and urinary bladder. Clinical workup showed no evidence of metastases in the liver, lung, the contralateral kidney, bone, or other sites. Left radical nephrectomy with lymphadenectomy was performed. Three months after surgery, computed tomography and magnetic resonance imaging demonstrated multiple liver masses, a mass in the right kidney, and a small nodule in the right upper lobe, radiographically consistent with widespread metastases. The patient declined systemic therapy and was discharged to hospice care. Grossly, the specimen consisted of a large kidney, attached adrenal gland, perirenal fat, and short segments of ureter and vessels. The kidney weighed 2162 g and was surrounded by a layer of unremarkable adipose tissue. The renal capsule was peeled away easily. 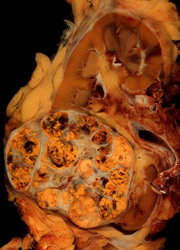 Cross-sectioning revealed a large renal mass that measured 14.8 Ã— 10.4 Ã— 10.3 cm and replaced most of the renal parenchyma. The tumor was confined within the renal capsule. The cut surface was lobulated and tan-yellow with focal hemorrhage and necrosis (Figure 1). Microscopically, a 1.8-cm area with SGCs was unexpectedly noted in a background of clear cell RCC, nuclear grades 2 to 4. Clear cell areas showed compact alveolar architecture and fine delicate vasculature (Figure 2). Mononuclear tumor cells, largely grades 3 to 4, intermingled and surrounded the SGCs (Figure 3). The giant cells contained 2 to 60 nuclei that were predominantly located peripherally (Figure 3, a) and that were occasionally piled up haphazardly at the center (Figure 3, b). The nuclei were similar or identical to those of adjacent mononucleated tumor cells, showing round to irregular contouring, and nuclei contained a single prominent round nucleolus. The SGC had voluminous cytoplasm that was clear at the periphery and intensely eosinophilic at the center (Figure 4). Occasional emperipolesis with cytoplasmic inflammatory cells was noted (Figure 4, inset). Angiolymphatic invasion by mononucleated tumor cells was focally present. Ureteral, vascular, or soft tissue margins were negative for tumor. Seventeen regional lymph nodes showed no evidence of metastasis. The adrenal gland was unremarkable. All tumor cells, both mononucleated and multinucleated, were positive for cytokeratin AE1/AE3 (Figure 5, a), CAM 5.2, vimentin (Figure 5, b), epithelial membrane antigen (EMA) (Figure 6, a), RCC, and CD10 (Figure 6, b) and were negative for S100 protein, muscle-specific actin (MSA), smooth muscle actin, CD68, carcinoembryonic antigen, HMB-45, Î²-human chorionic gonadotropin (Î²-HCG), and mucin. The most recent (2003) World Health Organization tumor classification recognizes clear cell RCC (70%), papillary RCC (types 1 and 2) (15%), chromophobe RCC (5%), carcinoma of the collecting ducts of Bellini (1%-2%), neuroendocrine carcinoma, and unclassified RCC, but does not consider giant cells as part of the classification. Four morphologically different giant cells have been described in RCC: osteoclast-like, pleomorphic or bizarre, rhabdoid, and syncytial. Osteoclast-like giant cells are usually found in high-grade clear cell RCC in variable portions and are strongly positive for CD68, weakly positive for vimentin, and negative for cytokeratin, EMA, CD45, and Ulex europaeus agglutinin I, a result that is consistent with histiocytic origin.1 Pleomorphic or bizarre giant cells may be seen in the sarcomatoid component of RCC. These are malignant tumor cells with high-grade nuclear features, and they demonstrate epithelial differentiation.2 Large, sometimes multinucleated, tumor cells may also be found in RCC with rhabdoid features.3-5 These have an epithelioid appearance; abundant cytoplasm containing distinctive globular, eosinophilic, intracytoplasmic inclusions; large, eccentric, vesicular nuclei; and macronucleoli. Immunohistochemically, rhabdoid cells show diffuse and strong staining for vimentin; are variably positive for cytokeratin, neuron-specific enolase, EMA, and S100 protein; and negative staining for CD68, CK20, desmin, MSA, and HMB-45. Ultrastructure and cytogenetic studies indicate that the rhabdoid cells have a similar origin to those of classic clear tumor cells. Presence of rhabdoid component was related to increased nuclear grade and pathologic stage. Such tumors appear to have more aggressive behavior and to carry a poorer prognosis, analogous to RCC with sarcomatoid change. Syncytial giant cells, the fourth type of giant cells, are the least commonly identified giant cells in RCC. To our knowledge, only 3 cases were recently reported as case reports in the English literature.6,7 The first case, published in 2002, documented a patient with a 10.8-cm clear cell RCC with SGC component.6 The SGC component was "extensive," but neither extent of involvement in the tumor nor nuclear grade of RCC was provided. The SGC had homogeneous, finely granular, and eosinophilic cytoplasm; commonly scalloped cell borders; 5 to more than 50 peripherally located nuclei with very similar size and shape; and prominent central nucleoli. The SGCs are strongly positive for CAM 5.2, AEl/AE3, and periodic acid-Schiff without diastase digestion; weakly positive for vimentin; and negative for MSA, smooth muscle actin, desmin, S100 protein, HMB-45, and Î²-HCG. Ultrastructurally, the giant cells are packed with organelles, mainly rough endoplasmic reticulum, mitochondria, lysosomes, and polyribosomes. The classic cytogenetic pattern, 3p- and 5q+, of clear cell RCC was the only chromosomal abnormality found. The patient was doing well 6 years after diagnosis. The formation of SGCs is thought to result from either fusion of mononuclear tumor cells or defects in dividing cells, since the SGCs and adjacent mononuclear tumor cells share nuclear features and an immunophenotypic profile. Our case is unique in several ways. First, the SGCs were associated with a higher grade RCC and aggressive behavior. It seems that the SGC component may be associated with either high- or low-grade RCC. secondly, the tumor showed lymphovascular invasion and imaging evidence of metastases in liver, lungs, and the other kidney. Even though previous reports documented association of SGCs with low-grade RCC and seemingly a lack of adverse prognostic effects, our case showed a high-grade tumor with widespread metastases. Third, our case had SGCs with both centrally and peripherally located nuclei. Fourth, we documented emperipolesis in RCC with SGCs. Finally, we documented that the SGCs are also positive for RCC, EMA, and CD10 in addition to positive staining for vimentin, CAM 5.2, and AE1/ AE3, as previously reported. 1. El-Naggar AK, Caber K, Ordonez NG. Renal cell carcinoma with osteoclastlike giant cells. Virchows Arch A Pathol Anat Histopathol. 1993;422:427-431. 2. de Peralta-Venturina , Moch H, Amin M, et al. Sarcomatoid differentiation in renal cell carcinoma: a study of 101 cases. Am J Surg Pathol. 2001;25:275-284. 3. Cokden N, Nappi O, Swanson P, et al. Renal cell carcinoma with rhahdoid features. Am J Surg Pathol. 2000;24:1329-1338. 4. Lee L, Marsh WL )r, Wen P. Pathologic quiz case: an 82-year-old woman with a renal mass: renal cell carcinoma with rhabdoid features. Arch Pathol Lab Med. 2004l128:109-110. 5. Kuroiwa K, Kinoshita Y, Shiralsuchi H, et al. Renal cell carcinoma with rhabdoid features: an aggressive neoplasm. Histopathology. 2002;41:538-548. 6. Lloreta J, Bielsa O, Munne A, et al. Renal cell carcinoma with syncytial giant cell component. Virchow Arch. 2002;440:330-333. 7. Cantalejo BF, Marco SV, Hernandez AS, Pena JR, Cebollada MMA. Syncytial giant cell component: review of 55 renal cell carcinomas. Histol Histopathol. 2004;19:113-118. Accepted for publication August 4, 2004. From the Department of Pathology, The Ohio State University Medical Center, Columbus. Corresponding author: Ping Wen, MD, PhD, The Ohio State University Medical Center, Department of Pathology, E-410 Doan Hall, 410 W Tenth Ave, Columbus, OH 43210 (e-mail: wen-2@medctr.osu.edu).